Allopurinol is well known as gout agent. 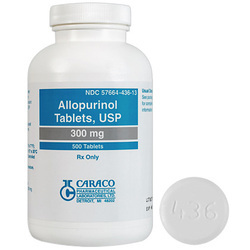 Allopurinol is useful in the treating high uric acid level and reducing the risk of further damage to the renal system. Allopurinol is useful in preventing further attacks of the gout. Allopurinol may cause an acute gouty attacks during the first few weeks of administration. In this case, it is best to start the treatment with NSAIDS or colchicine at the same time while allopurinol being administered. Besides acute gouty attack, other common side effect of allopurinol may include decrease metabolism of azathioprine and 6 mercaptopurine, hypersensitivity reaction and gastrointestinal discomfort. Allopurinol typically works by inhibiting xanthine oxidase. Xanthine oxidase, is a type of enzyme which involved in degradation or purine which lead to the conversion of xanthine to uric acids.